Mother's Day, aka Mothering Sunday, has it's roots in the church and is unrelated to the American holiday and the date varies each year. This year it falls on 31st March. Mothering Sunday was also known as Refreshment Sunday because the fasting rules for Lent were relaxed that day. The earliest Mother's Day celebrations can be traced back to the spring festivities of ancient Greece, in honour of Rhea, the Mother of the Gods. In Rome, the most significant Mother's Day festival was dedicated to the worship of Cybele, another mother goddess. Ceremonies in her honour began some 250 years before Christ was born. This Roman religious celebration, known as Hilaria, lasted for three days - from March 15 to 18. As Christianity spread throughout Europe, Mother's Day celebrations were held on the fourth Sunday in Lent - Laetare Sunday or mid-Lent Sunday - and they were adapted to honour the Virgin Mary and also the "Mother Church”. Most historians believe that Mothering Sunday evolved from the 16th-century Christian practice of visiting one's mother church annually on Laetare Sunday. Laetare comes from the Latin laetare, the singular imperative of laetari: "to rejoice" and was a liturgical day of rejoicing on the fourth Sunday of Lent. The Sunday is considered a day of relaxation from normal Lenten rigours; a day of hope as Easter was at last within sight. Traditionally, weddings which are banned during Lent could be performed on this day. Servants were released from service for the day to visit their mothers hence 'Mothering Sunday' which is now called Mother's Day. Others say it is because of the tradition of visiting the ‘Mother Church’. Most Sundays in the year churchgoers in England worship at their nearest parish or 'daughter church'. Centuries ago it was considered important for people to return to their home or 'mother' church once a year. So each year in the middle of Lent, everyone, laden with offerings, would visit their 'mother' church - the main church or cathedral of the area. It would make sense to think that it was the return to the 'Mother' church which led to the tradition of children, particularly those working as domestic servants, or as apprentices, would visit their mother and family. As they walked along the country lanes, children would pick wild flowers or violets to take to church or give to their mother as a small gift. 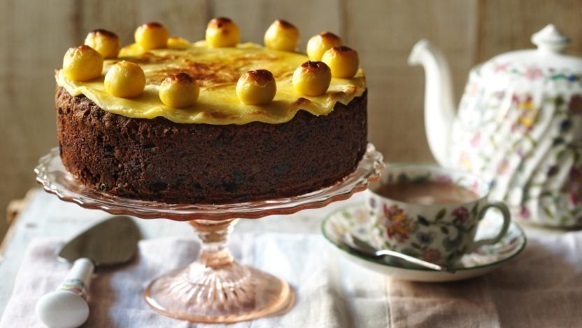 It also was it traditional to make a simnel cake and take it to Mother. half the blessing thou’lt give me"
A Simnel cake is a fruit cake with two layers of almond paste, one on top and one in the middle. The cake is made with 11 balls of marzipan icing on top representing the 11 disciples. (Judas is not included.) Traditionally, sugar violets would also be added. The name Simnel probably comes from the Latin word 'simila' which means a fine wheat flour usually used for baking a cake. There's also an amusing story that a man called Simon and his wife Nell argued over whether the cake for Mothering Sunday should be baked or boiled. In the end they did both, so the cake was named after both of them: SIM-NELL. Constance Smith reconnected Simnel cakes and what local customs of the day that survived with the honouring of mothers. Under the pen-name C. Penswick Smith she published a booklet 'The Revival of Mothering Sunday' in 1920. Constance Smith’s idea was not that Mothering Sunday should be limited to one Christian denomination, and it's popularity spread through such open organisations as the Boy Scouts and Girls Guides. Today the day has evolved new traditions. Mothers are usually given gifts and are treated to lunch or a fun outing on the day. Gestures don’t have to be grand. A great big hug and a hand-written card can mean just as much as a slap-up dinner or fancy spa day. Sometimes even more.